Pusser's Blue Label is a blend of five stills located in Guyana and Trinidad. Each marque is hand-selected, according to specification, for its individual smoothness, flavor and mellow depth. The blend is heavily influenced by rum distilled in a double wooden pot still which first went into production in 1732. The "Greenheart" staves of this old wooden pot still have absorbed decades of unique, organic flavouring compounds. 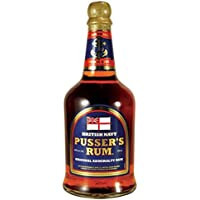 Following distillation, Pusser's Rum is aged in charred oak bourbon barrels-imparting additional smoothness and flavour. The rich flavor of Pusser's is all natural-no artificial flavouring or colouring is added!